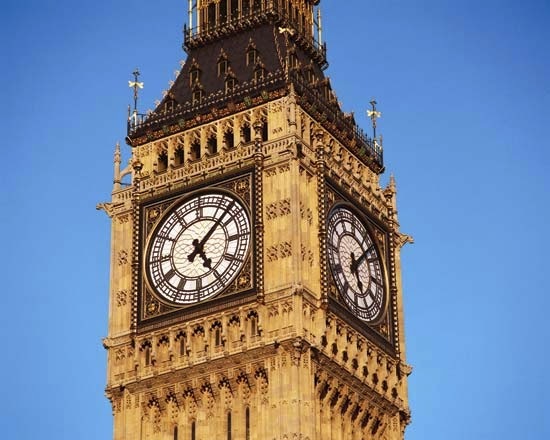 Big ben tower clock, famous for its accuracy and for its massive bell in london and around the world. The Elizabeth Tower is the name of the famous tower of Parliament - more popularly known as Big Ben. Although often referred to as Big Ben, this is actually the nickname of the bell housed within the Elizabeth Tower - and Big Ben's official name is the Great Bell. It is the great center of visitors. The clock was designed by Edmund Beckett Denison (later Sir Edmund Beckett and Lord Grimthorpe) in association with Sir George Airy (then astronomer royal) and the clockmaker Edward Dent. Denison’s principal contribution was a novel gravity escapement that imparted unprecedented accuracy to the clock. In a pendulum clock an escape wheel is allowed to rotate through the pitch of one tooth for each double swing of the pendulum and to transmit an impulse to the pendulum to keep it swinging. An ideal escapement would transmit the impulse without interfering with the free swing, and the impulse should be as uniform as possible. The double three-legged gravity escapement designed by Denison for Big Ben achieves the second of these but not the first.